Hi everyone! I’m a little late with the December scientist of the month, because we did things a little differently this time. Normally, I ask a scientist who volunteers via Twitter a couple of questions, and my buddies in Mrs. Podolak’s first grade class will go over the interview, talk about it, and come up with their questions. They pose the questions in the comments, and the scientist answers them directly. You can see examples from earlier this school year here. While this is a fun and productive set-up, this month I was able to connect our scientist David Shiffman, directly with the class over Skype. So, rather than post an interview with David, I’m just going to tell you a little about who he is, his science outreach activities, and recap a few of the questions the students asked him. David is a marine biologist studying sharks through the RJ Dunlap Marine Conservation Program at the University of Miami. From the lab’s website: “The mission of RJD is to advance ocean conservation and scientific literacy by conducting cutting edge scientific research and providing innovative and meaningful outreach opportunities for students through exhilarating hands-on research and virtual learning experiences in marine biology.” Essentially, their focus is ocean science, but the lab and its members are also concerned with conservation, technology, and education. David (bottom left) Skyping with first graders in Mrs. Podolak’s class. The last piece, education, is why I asked David to Skype with the class directly – he’s a pro at it! In addition to being a scientist, David is also a prolific science communicator; he blogs at Southern Fried Science, and is active on Twitter @whysharksmatter and Facebook. He provides a scientists’ point of view and expertise about shark conservation for mass media outlets like Slate, Wired and Scientific American. Additionally, he regularly works with students of varying ages, answering questions about sharks and ocean conservation. 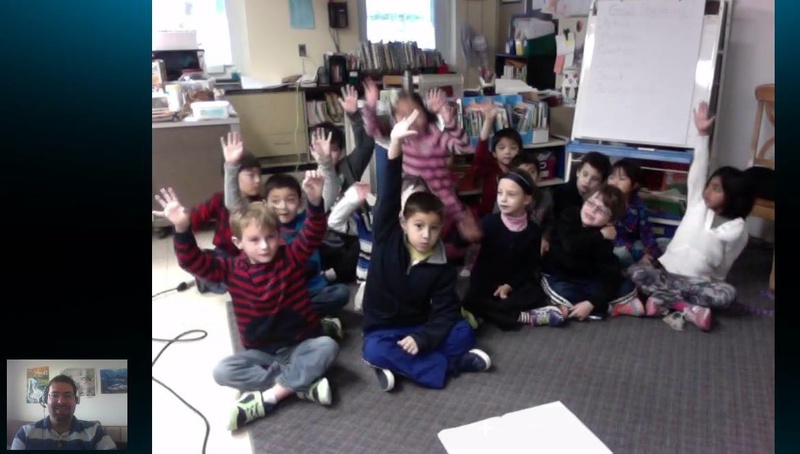 Including Mrs. Podolak’s class, David Skyped with an estimated 500 students in 2013! So what kinds of questions did the first graders ask him about sharks? I’ve listed a few below, with David’s answers. How many sharks are there in the world? Answer: There are over 500 different species. There have been new species discovered every two weeks or so for as long as you guys [the students] have been alive due to advances in deep sea exploration. How big can sharks grow? Answer: The smallest shark is about nine inches long, and the largest (a whale shark) is twice the size of a school bus. It is also the largest fish in the world. Do stingrays sting sharks? Answer: Yes, the stinger on a stingray is a defense mechanism. Sharks are one of the few predators of stingrays, which means that they do sometimes get stung. When did people first discover sharks? Answer: Aristotle wrote about sharks in ancient Greece. Scientists also know that sharks were around 250 million years longer than the dinosaurs. Why does a hammerhead shark look like it does? Answer: Hammerhead sharks have two extra senses. One, called ampullae of lorenzini, are jelly-filled pits on the nose that are sensitive to electricity and allow them to detect animals that are hiding under the sand. The other is a lateral line that detects vibrations. These are just a few of the many questions that David answered for the students during their Skype interview. If you are interested in having David talk to your own students, or have a question for him you can contact him at whysharksmatter@gmail.com or on Twitter @whysharksmatter. Thank you, David for being our December Scientist of the Month! Also: shameless plug for this segment, but if you’d like to be one of our Scientists of the Month, I’m currently accepting volunteers for 2014! I alternate months between men and women; you don’t have to be a PI or have your own lab, and I’m open to featuring any science field. You can contact me on Twitter @erinpodolak.